Has he ridden there a lot? So you can just get these files from him to go ride there yourself? In a word, no! Walter is very selective in who he gives his tracks too, we speak on a regular basis and he explained to me he likes to get to know the person, make sure they are up to riding there, have the skills and wherewithal to complete the task. Why? Having personally ridden some of Walters tracks and a lot of similar areas its a safety thing, Siberia is remote, very remote, you are there and no one is coming to help (mostly) so you need to be VERY self-sufficient. Why Sibirsky Extreme? Sibir is the Russian word for Siberia … and Sibirsky, therefore, means Siberian. Sadly deskbound at the moment. Not sure when I will have the chance to go again on a long ride…. Hopefully this summer I will return to Central Asia. A Husaberg 570 with 24 liters of fuel capacity and a list of mods longer than my arm. Its my favorite bike for the high altitude mountain trails of places like Kyrgyzstan and Tajikistan. I am lucky enough to have been able to pretty much indulge my adventure bike fantasies over the last 10 years. Commissioning the Lyndon Poskitt 690 RFR rebuild was pretty much my unlimited budget fantasy. I had fantasized about using the 690 Rally as an adventure bike since around 2010. When Lyndon started doing it and started modding the bikes for Adventure purposes in 2014, I thought that’s it … I have to pull the trigger on this now or never. There is a very limited supply of the bikes globally, and if one guy starts popularising them, their value will go thru the roof and they will become as rare as rocking horse sh!t … and sure enough that is what happened. I was lucky enough to get in early, but the overall price of the bike and mods was still well and truly beyond (close to double) the price of any new bike even with every single options box ticked. I think I have 4 … in Eurasia, I always get a special thrill out of riding Mongolia, Kyrgyzstan, and Tajikistan. There is a lot of amazing riding in Russia too, but there is an excitement that makes the hairs on the back of your neck stand up when you cross the border to one of those exotic 3, and ride away from the border post. The other country I have that feeling with is Bolivia in South America. Love the wildness, scenery, and sense of freedom you get there too. All of those places you just think to yourself as you ride away from the border entry post … “This is going to be awesome, bring it on”. The BAM Road is special because I think more than any other route I have ridden over the years, that’s the one that people associate with me and one that perhaps I got the most publicity for. It was an old forgotten track that hadn’t been ridden by a foreign motorcyclist since it was in half decent condition in the early 1990s (and even then I know only two people that rode it then – Eric Haws and Helge Pedersen). Now it’s a dream adventure trail – 6 hard long days. 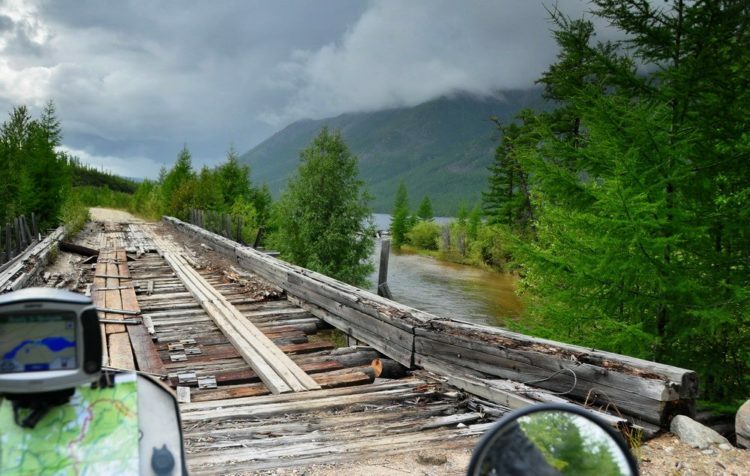 It turned to be hard and adventurous but do-able and realistic if you push yourself, and the epitome of what people dream of when they fantasize about adventure riding in Siberia – broken bridges, loads of big rocky water crossings, railway bridge crossings, bikes on the back of a truck for at least one water crossing. Guys who have been adventure riding round the globe for 20-30 years have told me that riding the BAM was probably the highlight of it all, and that puts a big smile on my face. I would like to spend more time in South America and see a lot more than I have so far. Way back in 1994 … the Soviet Union had collapsed and was pretty lawless with no central authority. I was riding with a University buddy in an attempt to ride from Tokyo to London. Despite being constantly warned about bandits (highwaymen) along the roads, we had yet to see any 2/3 of the way to London. Then one day on the western steppes of Kazakhstan, a few hours ride from entering European Russia, we were riding on an empty stretch of very bad highway in the middle of absolutely nowhere. Way up in the distance ahead we saw a truck pulled over at the side of the highway. Nothing and no-one else was in sight nor probably existed for 30 miles. As we got close to the truck, about half a dozen guys stepped out from behind the truck, blocked the road, and waved us down to stop. They were loaded up with semi-automatic rifles, bullet belts, pistols, and started aggressively asking us all sorts of question about what we’re doing there. Their aggression softened when we said we were two students riding motorcycles from Tokyo to London. The best days are always NSFW to go into detail on. It can sometimes be a monk-like existence on a bike, camping a lot of the time, seeking out remote areas. But an unexpected “liaison” with a local or fellow traveler always makes for a memorable day. Well, I can list a lot of reasons … the well-known ones about travel broadening the mind, giving you different perspectives on the world etc. I am struck by how many want to travel (or believe they want to travel) and yet don’t do it. It’s always easy to find excuses to stay where you are and not make any changes in life. #1,2, and 3 … Weight, weight, and weight. When I read the ride reports of seasoned adventurers, I note that they all have different philosophies and bring that with them and integrate them into the ride reports, but if there is one thing the guys who (a) have been doing it a long time and (b) have the resources and are unaffiliated enough to have a free choice of gear have in common, its light bikes and light packing. There has been a very unfortunate and misleading push from the manufacturers and the motorcycle media to create the idea that serious Adventure riders ride heavyweight bikes with big metal boxes. take the lightest bike you can for the job at hand. be bold with your route. The more off the beaten track you go, the more adventurous it will be and the more satisfaction you will get. There are very few places where locals are actually dangerous and should be avoided (I am thinking Somalia… but not a lot else). In general, locals are always a lot more friendly and hospitable than you have been led to believe. Finance. Right now I help link investors to companies that need investors. Getting out of your comfort zone but not in a reckless way. I always liked exploring on 2 wheels. Trying to find things that others haven’t done before or going where others haven’t been. Finding new routes, or forgotten passes, or hidden trails in exotic remote places. That’s adventure for me. There is one taken one saturated cold wet evening on the Eastern BAM in 2009 … Terry, Tony and I had just ridden 9 km (6 miles) in a whole day. The bikes were man-hauled in and out of bogs and swamps all day. Terry’s bike had sucked in water into his crankcase and his oil was all milky. We were being eaten alive by mosquitoes and we found an old railway maintenance hut made out of sleepers towards the end of the day. I fought back the mosquitoes and went up the railway embankment to reel off a couple of shots of this depressing scene … bikes and the hut in the middle of the Siberian swampy forest. And it turned out very romantic (at least I think it is). If you could send people to just one place in Russia where would it be and why? The Trans-Siberian Highway is in blue, and the BAM Road in purple. ***About the BAM – The BAM – Baikal-Amur Magistral – was a transcontinental railway line commenced in the 1930s under Stalin, and completed almost 70 years later, in 2003, under Putin (the track was finished in 1991, but tunnels were not finished until December 2003). The Russians already had the Trans-Siberian, but it hugs the Chinese border, and to put it bluntly, the Chinese are the only realistic external threat to the territorial integrity of Russia. So having a vital ‘one and only’ railway line next to them for thousands of kilometers was strategically terrifying, even back in the 1930s. Now its a serious national security risk. So they began building the BAM Railway, a second route across Siberia, but this time at least several hundred kilometers from the Chinese border. Why did you design your own luggage? None of the manufacturers made stuff that did the job. Manufacturers don’t do this level of adventure riding. They had always typecast two types of adventure luggage. Big metal boxes and simplistic soft luggage. The metal boxes were what people felt was the only option because they were lockable and kept water out. The soft luggage available was not lockable, not waterproof, not even resistant to grazing if you had a crash. They were made out of simple canvas or PVC. I much preferred the soft luggage but it struck me that it really shouldn’t be that hard to make them waterproof, crash proof, lockable, etc. I drove around Europe looking for a bag maker to take the project on and finally commissioned some bags. We went through 3-4 prototypes before I was happy with what came out of it and I then took them to Siberia in 2012, handing the design and manufacturing details to Adventure Spec to run with. It copped a bit of flack in the early days as people didn’t get the need for the higher functionality (or price) compared to what they thought soft bags should be, but it seems to be accepted now, with the likes of Endurostan and Mosko Moto also making high-end soft luggage. Why do you ride with an open face helmet? It was something I didn’t do in my earlier (1990s) rides but I picked it up after watching Mondo Enduro and Terra Circa some time around 2002. They initially did it so their riders would be identifiable on camera (they were filmmaking) but they noticed it had a very positive side effect … you don’t have to take your helmet off to interact with locals. And interaction with locals can often be a real highlight of the journey. With a full adventure style helmet, you can look like a threatening alien to locals in simple villages. With an open face helmet, a smile immediately breaks down barriers and is immediately visible to the locals. Have you ridden anywhere that is no longer easily accessible to other riders?